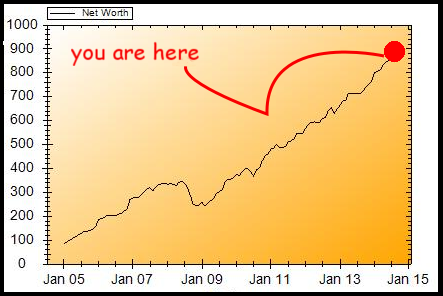 In 2003, I started tracking my net worth via excel spreadsheets. Then in 2005, I started posting monthly updates to networthiq which creates historical graphs to show progress. I no longer use networthiq because the site is dying. For daily expenses, I use the free android app moneywise. This allows me to quickly enter costs when I’m out and about. There are probably better apps out there but I feel it’s sufficient for my needs. At the end of the month I can email reports to my personal computer so I can then parse the data more carefully. My average salary — gross, not net — over my 13 working years is 98K. I’m 36 37. I graduated from college with a bachelor’s degree in computer science in 1999 and went into software support. Since then I’ve moved around the field a bit, from QA to debugging to infrastructure and application server support maintenance. When I left school I had 40K in student debt. I paid this off in 2002. I started contributing to my 401(k) in 2003. At the same time I started to drop the maximum allowed into my IRA. In 2005 I started maxing out my 401(k) most years. My accounts are held with Vanguard. I believe in passive investing through index funds and have never picked individual stocks. I’ve held the following allocation since 2007. I have an equity line of credit on my house which I keep close to a zero balance. I treat this as my emergency fund so I don’t need to hold much cash. It’s at 2.74% right now which is pretty cheap money. Not starting my 401(K) contributions earlier. The first 3 years of my working life I didn’t contribute a dime, even though my employer offered a match on the first 6% of salary. Related regret: Not maxing my 401(k) contributions between 2008 and 2010. Very stupid. Not paying more attention to taxes until very recently. I put too much money into my taxable accounts. My rationale was that I’d need this money in order to retire early. As it turns out, I didn’t. There is a procedure which allows you to put money in your 401(k) or traditional IRA, roll it over to your Roth IRA tax free, and withdraw it from your Roth (again, tax free) 5 years later. Thanks to the Mad Fientist for this strategy. It works best if your post-RE income puts you in the 15% income bracket. Not following this strategy earlier has cost me tens of thousands of dollars. Frankly I don’t want to sit down and do the math on it because it would be depressing as hell. I probably could have quit working two years ago — or be sitting on significantly more money. Rebalancing even during gain years in my taxable accounts. If you don’t want to make the same mistakes, read up on tax strategies for taxable versus non-taxable accounts. Once you understand the basics, read the entirety of the mad fientist’s blog. Then read it again. Then you’ll understand why I feel pretty dumb about making the decisions I did. Reducing your tax burden is a lot more important than you realize. Especially when you’re just starting out, it’s really hard to focus on taxes because it seems like saving and investing is so much more important. But you have to realize that saving on taxes is a form of saving, and it can help shave years off of your FI goal. I’ve shared more detailed info in the Mistakes Were Made post. Other than 1) my first year out of college, when I spent like a fool and 2) the year I bought my house, I consistently saved over 50% of my net earnings. Some years I hit 70%, mostly due to earning more. I stumbled upon the index investing idea early, reading Bogle’s Common Sense on Mutal Funds. It made sense to me, and that’s the path I’ve taken. Most of my friends and colleagues were into individual stock picking which felt like gambling and just never resonated. Bogle’s book backs up the idea that individual stock picking as well as actively managed funds are both losing propositions and explains the reasons why in plain English. I saved the entirety of every bonus I’ve ever gotten. Around 60K of post-tax money over 12 working years. After investment earnings on top of this amount, it has translated to about 110K in current net worth — 15% of my entire stash. For me this underscores the importance of saving extra money instead of using it to increase your annual cost of living. My partner is frugal so we see eye to eye on most financial issues and rarely have disagreements over money. It’s probably important to note that the numbers above represent my own net worth. These figures do not combine our assets. My SO happens to have a similar level of assets, making our total net worth roughly double the amount I’ve listed above. This means that we have likely over-saved, if anything. How has nobody commented on this before? This is excellent stuff! You almost appear to write as though MMM, jlcollinsh, and the Mad Fientist are “above you” but you write some of the funniest material I’ve read in the financial independence space. This article also demonstrates your ability in getting right to the meat of the content, humor aside! No fluff, just your factual history, concrete numbers, and great recommendations. Perfect!